The all-new Chrysler 200 is available in all US dealers since early June. July will be the first full month. Sales volume are expected to be more than good. The 2015 Chrysler 200 is the third major launch of Chrysler Group since Fiat’s era. First came the Dodge Dart in early 2012. Then it was the time for the new Jeep Cherokee, revealed in the first half of 2013. Finally Chrysler brand presented the all-new 200 sedan in March 2014 and the first critics pointed at very good comments. The brand needed a fresh product and the mid-size sedan was urgently waiting for a decent successor despite the fact that its sales registered records in 2012 and 2013 with more than 120.000 units. However these numbers aren’t enough in American D-Segment as it’s quite evident when looking at the competitors volumes. 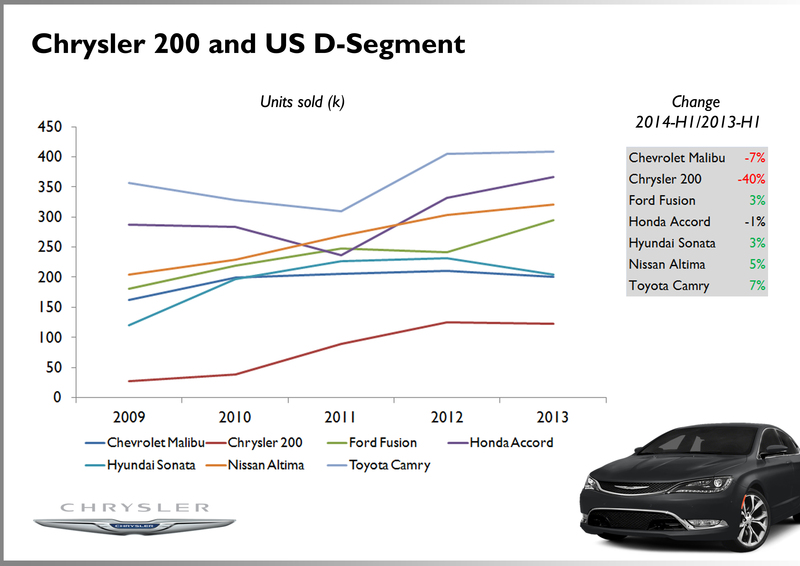 In 2013 Toyota sold 3,3 times more Camrys than the Chrysler 200, while Honda was also ahead selling 3 times more. The Nissan Altima, Ford Fusion and Chevrolet Malibu were also ahead. In total the old Chrysler 200 managed to control 5% of D-Sedan (non premium) segment. In 2012 all D-Segment counted for 19,8% of total sales, and was the second largest after the SUVs (all types). For a group like FCA and its important 4th position in US ranking, having a proper mid-size sedan isn’t an option but a must. 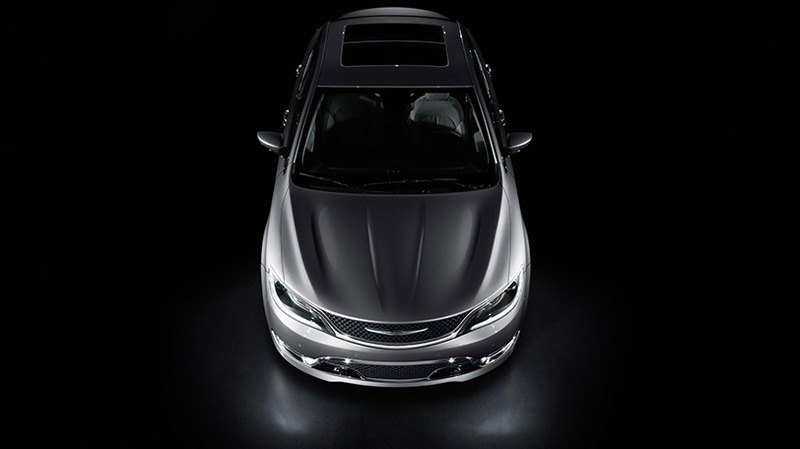 Elegant, sophisticated and modern are the best words to describe the exterior design of the 2015 Chrysler 200. The rear view is a good mix of American and European lines that transmits originality. Chrysler made a good job with this mid-size sedan. The interior could be easily considered the best of its segment. Very good design details along with a high perceived quality. And that’s why the all-new Chrysler 200 exceeds expectations. Its sober but elegant and modern exterior design are positively commented by car magazines and internet users. Definitely Chrysler made a big improvement with this car, which is by the way the first model of the new Chrysler era. By 2018 the brand should be selling around 800.000 cars in NAFTA markets, and to achieve that Chrysler needs more products that will use the same family feeling of the new 200. But is it going to bring good numbers to FCA? first of all it is a nice car: it looks modern, elegant and sophisticated. Second, it has a lot of interesting features that can’t be found in other cars of its segment (such as the 9-speed automatic transmission, advanced all-wheel drive, 7″ Led instrument cluster). The new 200 has the best in class available horsepower (295 hp) and the best interior storage. Besides, its starting price is below the competition’s. Unlike the Dodge Dart and the Avenger, with prices that are quite close but with 2 very different positioning (the Dart is more European-concept, while the Avenger is what Americans expect from a sedan), the Chrysler 200 doesn’t have competition inside the brand. The Chrysler 300’s prices start at $31.000, well above the 200’s, starting at $21.700. The only problem would come from outside: the 200 will for sure steal some Dodge Avenger’s potential clients but that would be in line with the decline period of the Dodge, which will be out of production in the coming months. 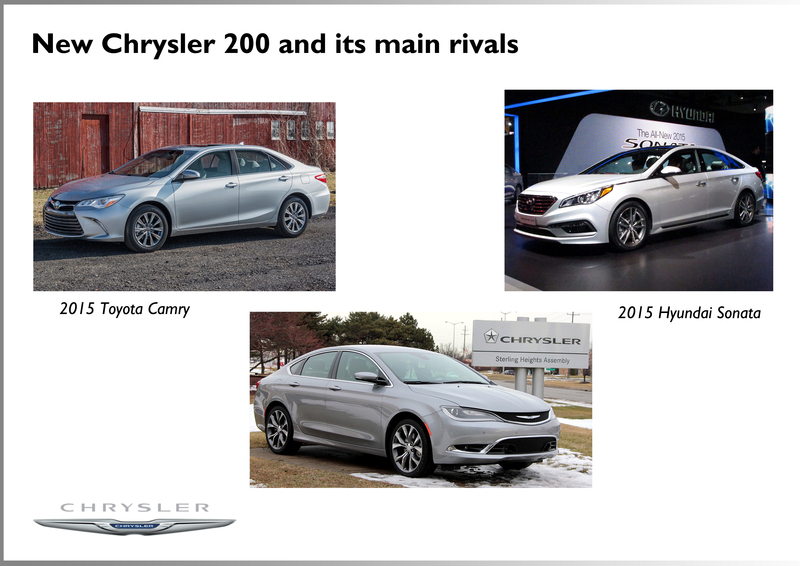 The new Hyundai Sonata and Toyota Camry will be Chrysler 200’s most complicated rivals. They are already very popular and with the new generations they will catch even more clients. Based on all those attributes, and the right moment of its launch, the all-new Chrysler 200 will hit the market with much better results than its predecessor, just as the new Jeep Cherokee is doing. There are no public sales volume targets for the 200, but Chrysler should increase its market share by 2 or 3 points and position the new sedan as one of the top 5 best-selling mid-size sedans in USA and Canada. If the car is that good why not to export it to Europe? when Chrysler published the first official pictures, many Italians wrote that the 200 should be available in European markets as a Chrysler or as a Lancia. Many people said that it could be the perfect car to be positioned between the premium and mainstream European D-Segment. But the true is that the new 200 won’t come to Europe because Chrysler and Lancia brands will leave their presence to welcome the Alfa Romeo’s sedans. Chrysler brand got out of Europe when Lancia rebadged its range, while Lancia will concentrate its efforts on the Ypsilon for Italian market only. Therefore the beautiful 200 wouldn’t have a brand under which it could be commercialized. Besides, it is too American for European taste (is quite big for European D-Segment), and the last thing Marchionne wants is to complicate things to Alfa Romeo and the coming Giulia sedan and SW. Is it going to happen to all future Chrysler models? what about the next generation Voyager/Town & Country? certainly it won’t be sold as a Lancia, and is hard to think of it as a Fiat. What’s for sure is that the new Chrysler 200 is a great product, it will be a boom in D-Segment, and it won’t come to Europe. Sad day, now that I know it won’t come to Europe. I think that all future Chrysler models should come to Europe if there is market for them. In particular the next generation of Voyager, with a correct european version, if it will be possible. The 200, you are right, isn’t enough “european”. But the Dart/Viaggio is perfect for European markets. Why there isn’t a FIAT version for Europe? 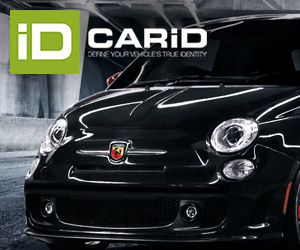 Because Fiat as a brand isn’t strong in C segment. No one considers a Fiat when buying a compact car. Fiat is more positioned as the brand of the small and efficient cars. The Viaggio would have the same sad life of the current Bravo. They are both good products but they are not in the consumers minds. Juan, ten years ago, Hyundai/Kia was’nt in the Europeans consumers minds… and today? In my country, Belgium (and probably in all West Europe), for a lot of consumer, Fiat=poor design (except 500), poor quality and poor technology ! Yes, the inventor/precursor of modern Direct injection diesel (1988? ), Multiair, Start/Stop (1982? ), Robogate, modern CVT, complex sharing platform (1978 for VSS concept, 1984 for Thema family, 1988 for Tipo family)… and designer of 128, Ritmo, Uno, Tipo, Gpunto, Coupè, Barchetta, Panda, Multipla, have poor design and poor technology !!! My opinion is that Fiat is really one of the best car maker (to design, and to build car) and just needs to be more creative on marketing. For example, how many consumers know the advantage of the Multiair and know who is the inventor?? I agree. The problem is marketing and the way they sell cars. They need to improve a lot. Meanwhile they must do what they do best: small and efficient cars (Fiat brand) to gain more market share and money (the 500 is the best-selling city-car and is quite profitable). To launch a Compact car now means a lot of investment and few success results. New Voyager could be sold in Europe as Lancia if only Fiat decide to keep the brand alive. And there is a little hope …. There aren’t enough reasons to keep a brand that no one wants and brings loses only. The 200 should come to Europe now Lancia is dead. In fact the Chrysler brand should be FCA competitor to Ford, and major Asian brands, as mentioned above. The Fiat Aegea should become the Chrysler 100 and then add 200 hatch, (Fiat Ottimo) to range.